The Legionnaires disease outbreak was traced to the Bellevue-Stratford Hotel at Broad and Walnut Streets, where the annual American Legion convention was held in 1976. The Bellevue-Stratford opened in 1904, replacing the former Bellevue and Stratford Hotels. It was considered one of the most elegant hotels in the nation during its heyday, hosting celebrities and politicians, including nearly every U.S. president since Theodore Roosevelt, as well as local social elites. 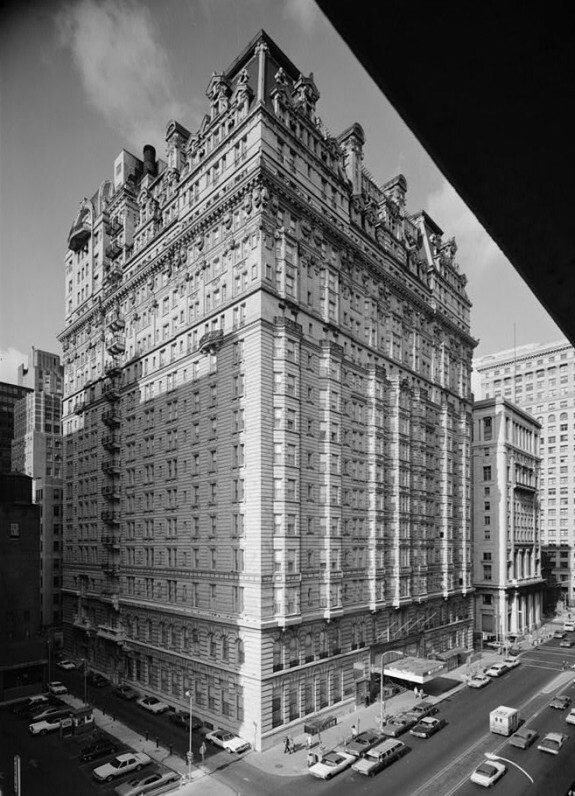 Negative publicity surrounding the Legionella outbreak forced the hotel to close in November 1976 and demolition was considered. 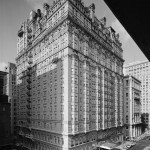 After a $25 million renovation, the Bellevue-Stratford reopened in 1979, but struggled to fill its rooms. It closed again in 1986 and stood empty until it was reopened in 1989. After multiple owners and names, in 2010 it was renamed the Hyatt at The Bellevue and as of 2016 continued as a mixed-use commercial and hotel property that retained some cachet as a meeting place of movers and shakers. 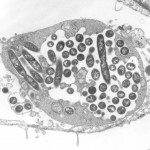 In January 1977, researchers were able to identify an until-then-unknown genus of bacteria responsible for the mysterious Legionnaires’ disease, which had killed thirty-four people. Dubbed Legionella after the American Legion, whose conventioneers were afflicted, the bacteria was found to thrive in large air conditioning systems such as those used in hotels and hospitals. 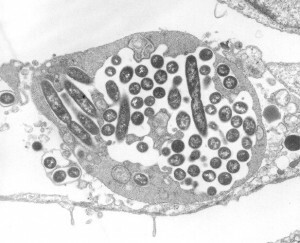 Legionella infects the lungs when contaminated water or soil is aerosolized and inhaled. It cannot be spread from person to person. It was found to have caused previous outbreaks in hospitals from as early as 1965. Once the disease agent was identified, a cure was found. Today, Legionnaires' disease is treated with antibiotics. The Legionnaires’ disease outbreak began in July 1976, when the American Legion held its annual convention at the Bellevue-Stratford Hotel at Broad and Walnut Streets. Thousands of American Legion members attended the conference. After returning home on July 24, several attendees developed pneumonia and very high fevers; within a week twelve had died. The disease infected a total of 221 people and its cause eluded epidemiologists for months, as tests for illnesses that caused similar symptoms came back negative in the Legionnaires. This photograph was taken at a symposium on Legionnaires’ disease in November 1976, two months before the Legionella bacteria was identified. 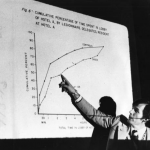 The outbreak of a mysterious pneumonia-like disease in the Philadelphia region in the summer of 1976 puzzled doctors and public health officials. 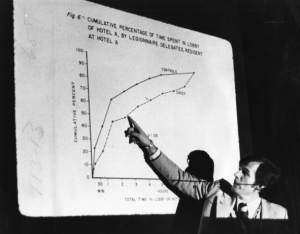 Many of the sick had attended an American Legion convention at the Bellevue-Stratford Hotel, giving the new illness the name “Legionnaires’ disease.” Months later, doctors discovered that bacteria in the hotel’s air conditioning system had caused the outbreak. By then, thirty-four of the 221 people who fell ill had died, and the Bellevue-Stratford Hotel had closed its doors for lack of business. The outbreak occurred during the bicentennial of the Declaration of Independence. After returning home on July 24 from the three-day American Legion meeting in Philadelphia, several of the legionnaires began to fall ill with chest pains, high fevers, and lung congestion. By August 2, twelve had died. Doctors initially suspected that swine flu might be the culprit. If so, it was feared that Philadelphia could become the epicenter of an influenza pandemic, on the order of the 1918 “Spanish” flu that had killed as many as 100 million worldwide. In this light, Pennsylvania state health director Leonard Bachman (b. 1925) considered a quarantine of the city. Bachman held daily press conferences—sometimes twice a day—to update the public on the progress of the epidemic, while the city of Philadelphia set up a hotline to take reports of potential new cases. Meanwhile, the numbers of sick continued to grow: by August 6, twenty-five had died, with 112 others hospitalized. However, tests for known viruses, bacteria, and fungi that might cause similar symptoms all came back negative. Moreover, the disease showed no evidence of secondary infection; that is, the sick did not seem to pass the illness to those with whom they came into contact. There would be no deadly pandemic, but the question remained: what was killing the legionnaires? To find out, a team of local and state health officials distributed a survey to the ten thousand people—legionnaires and their families—who had attended the meeting. Through computer analysis of their responses, epidemiologists determined that the sick had all been inside the Bellevue-Stratford Hotel, although some had stayed elsewhere. Moreover, several attendees of the International Eucharistic Conference, which took place at the hotel shortly after the American Legion Meeting, also became ill with the same mysterious pneumonia. On August 14, epidemiologists added presence at the Bellevue-Stratford to the case definition of the new disease. In January 1977, researchers finally pinpointed the source of the legionnaires’ pneumonia. 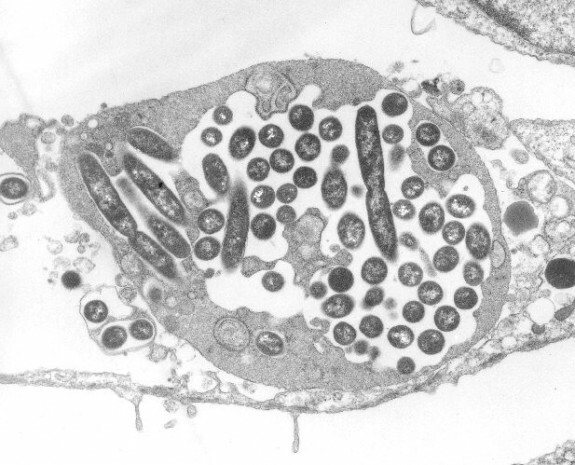 It was not, after all, poisoning from nickel carbonyl or some other industrial poison, but a bacterium from a previously unknown genus, subsequently named Legionella after the first recognized outbreak. Researchers thereafter realized that Legionella bacteria thrive in large central air conditioning systems, such as that used by the Bellevue-Stratford. They also concluded that similar outbreaks had occurred going back to 1965 in hospitals and large office buildings but had escaped detection at the time. However, the names of both the disease and the bacteria remained linked to the initial outbreak in Philadelphia. A 2002 outbreak of the disease at a Jewish nursing home in suburban Horsham, Pennsylvania, killed two residents and sickened seven others, as well as an employee. In 2005, two attendees of the Pennsylvania American Legion convention in King of Prussia were sickened with Legionnaires’, reviving memories of the 1976 crisis, although both men survived. Since the discovery of the Legionella bacillus, doctors have been able to treat cases of the disease with antibiotics. Dan Royles is Assistant Professor of History at Florida International University, in Miami. His first book, To Make the Wounded Whole: African American Responses to HIV/AIDS, is under advance contract with the University of North Carolina Press. “The Philadelphia Killer.” Time Magazine. August 16, 1976. Cravens, Gwyneth, and John S. Marr. “Tracking down the Epidemic.” The New York Times Magazine. December 12, 1976. Fraser, David W., Theodore R. Tsai, Walter Orenstein, William E. Parkin, H. James Beecham, Robert G. Sharrar, John Harris, et al. “Legionnaires’ Disease.” New England Journal of Medicine 297, no. 22 (December 1, 1977): 1189–97. Jones, Gilda L. “Legionnaires’”: the Disease, the Bacterium And Methodology. Atlanta: U.S. Dept. of Health, Education, and Welfare, Public Health Service, Center for Disease Control, Bureau of Laboratories, 1978. Accessed November 2, 2015. Leonard Bachman Papers, Pennsylvania State Archives, Harrisburg, Pa.
Hyatt at the Bellevue, 200 S. Broad Street, Philadelphia. Thanks, Dan for telling this story! After the outbreak, the Bellevue stayed closed for two years. It had to re-open as “The Fairmount Philadelphia” in 1978, under the management of the Richard Rubin Company, because of the stigma attached to the name “Bellevue.” It was re-sold to the Westin chain and struggled to stay open throughout the 80s as the “Bellevue-Stratford.” Today, it’s owned by the Hyatt chain as a mixed use building and operates under the name “The Hyatt at the Bellevue,” the events of 40 years ago being largely forgotten.